From Skidmore College statistics professor Michael Lopez comes the handy chart you see above, plotting the 2014 win totals of all 30 MLB teams against preseason predictions from Vegas and what Lopez calls his "Statsheads Prediction." Lopez created the "Statsheads Prediction" by averaging preseason forecasts from several sabermetric websites (Baseball Prospectus, Fangraphs, Prediction Machine, and Trading Bases). For Vegas odds, he used over/unders set by sportsbetting.ag in early March. With this, we can get a decent sense for who was better at predicting how the MLB season would shake out this year: Vegas or the nerds. The results are what most fans will expect. (Yankees and Red Sox were disappointments, Orioles and Angels were better than anticipated, the Tigers were pretty much what people expected.) 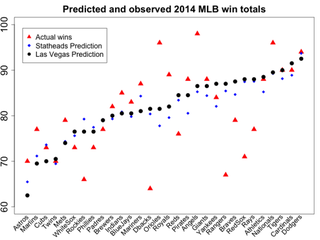 But it's still fun to see whether saber websites or Vegas odds were more accurate in predicting your team's season.